Credo is a Latin word that means "a set of fundamental beliefs or guiding principles." The values that guide our beliefs and decision-making are spelled out in our credos. Put simply, our credos challenge us to put the needs and well-being of the people we serve first. 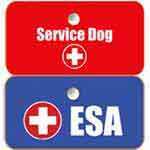 That includes your emotional support animal (ESA) or service dog! 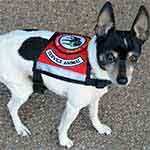 At National Service Animal Registry, we'll treat you with genuine friendliness and a smile. Of all your options, YOU CHOSE US, and we're very glad you did! 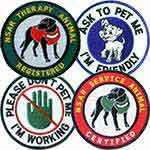 No matter who you talk with or email at National Service Animal Registry, we'll give you the attention you deserve. We'll take the time to make sure your questions are answered and that you feel comfortable shopping with us. We are emotionally invested in helping animals help people, and each one of us takes pride in providing the best, old fashioned customer service available. It's a very simple concept really: We treat our clients the way WE want to be treated: With respect, courtesy, and patience. If we EVER fail to do that, please let us know! We guarantee your satisfaction! 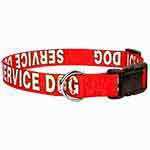 At National Service Animal Registry, we offer you lots of options so you can find exactly what you're looking for. "WOW!" 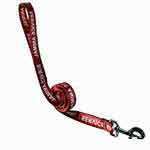 - If you don't say that when you receive our products, then make sure you let us know. That probably means someone made one of our rare mistakes. The fact is, you work hard for your money and deserve to get your money's worth (and more). We're RARELY accused of not providing that! We are committed to excellence! That means we want you to be completely satisfied with every purchase. If a problem exists, we'll do whatever it takes for you to be satisfied. If for some reason a product doesn't meet your satisfaction, we'll make it right (and we'll make that a priority)! And if we can't satisfy you, we'll gladly refund your money. 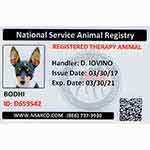 As National Service Animal Registry grows, we make this promise to you, our valued customer: We will read every single comment communique or email sent to us, and respond to every email we receive. That's because we appreciate our clients taking the time to write to us. And it helps us make sure that we'll continue to exceed your hopes, needs, and expectations! So write to us. Good or bad, we want to hear it!